If your home is looking dated or drab, contact the paint professionals at C B Paint Co.! We specialize in interior and exterior house painting, breathing new life into your old home. Our team takes pride in what they do and we’re well-known for leaving behind only the highest quality results. Contact us today for a free quote and let us show you just how beautiful your home can look! Anyone can pick up a brush and slap paint on a wall, but that doesn’t mean the results will come out looking the way you want them to! If you’re going to paint your home’s interior or exterior to liven it up or restore its appeal, it pays to hire a proven professional painting contractor in Beaverton, OR. 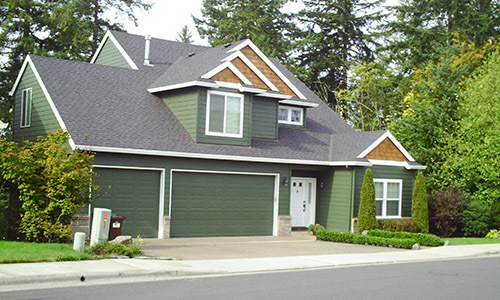 At C B Paint Co., we’ve been painting homes in the Washington County area of Oregon for decades! Whether you’re revamping your interior or want to restore the curb appeal of your home’s façade, count on us for simply stunning results. As a family-owned and -operated company, you can expect us to treat your home as if it were our own, with results that illustrate our attention to detail and pride in our craft. As a full-service residential painting company in Beaverton, OR, we’re equipped to tackle projects of all sizes—even those beyond painting walls. We’re known for our painted, stained and lacquered cabinetry work, as well as deck painting. We even offer power washing and gutter cleaning services, to ensure proper prep for a better finished paint job. Unlike other paint companies in the area, we put two coats of paint on the exterior of homes to ensure the color lasts a lifetime! We’ll help you unlock the true beauty of your home by giving it an appeal you’ll appreciate each and every day. Consult with us today and learn more about our dedication to our customers and their homes! You won’t find a work ethic like ours anywhere else! We hire only dedicated painters who take pride in what they do and who treat your home as if it were their own. Customer service is our top priority. We guarantee the job is done right the first time, meeting or exceeding your highest expectations. We’re not happy unless you are! We’re a licensed and certified painting contractor (LED certified certification number LBPR52621). Our team has more than three decades of professional painting experience and the skills to truly transform your interior or exterior. We offer free estimates to all of our customers upon consultation, so you know exactly how much you’re paying and exactly what you’re getting for your money. Is your home ready for a fresh coat of paint? From your interior walls to your exterior surfaces, C B Paint Co. is ready to get to work. Contact us today for a free estimate on paint services!